Whenever you visit the dentist, it’s usually the doctor that gets all the credit, but in truth, giving people healthy smiles is always a team effort. The second week of April is actually National Dental Hygienist Week, a time where the dental community highlights these often unsung heroes of oral health. What all does a dental hygienist do? What does it take to become a dental hygienist in Oklahoma City? Today, we answer these questions so you’ll appreciate your next dental cleaning even more! Consistent oral hygiene is absolutely essential to having a strong and healthy smile throughout your life. While diligent brushing and flossing are important, so is getting professional cleanings from a hygienist. They have the skilled eyes and special instruments needed to remove plaque and tartar from the areas of your mouth that your tools at home simply can’t reach, which helps stop cavities before they even begin. Hygienists can also determine how effective your oral hygiene is at home just by looking at your mouth. They can make suggestions as to how to improve your routine or which types of products you should be using. Want to know the perfect type of toothpaste for your unique smile? Just ask a hygienist! How Does Someone Become a Dental Hygienist? The first step to becoming a dental hygienist is to obtain an undergraduate degree. Many hold an associate’s degree such as an Associate for Applied Science in Dental Hygiene. Then, they have to get licensed to practice in their state, which can include becoming certified in CPR, getting letters of recommendation, and completing written exams. Basically, by the time a hygienist is actually cleaning your teeth, you can more than trust that they know their stuff! Many go on to get advanced degrees as well in order to further their career and bolster their clinical knowledge. In addition to all of the technical requirements of the job, the right personality is also extremely important. Hygienists are usually one of the first staff members people meet when they go to the dentist, and it’s up to them to help a patient feel comfortable and welcome right from the start. 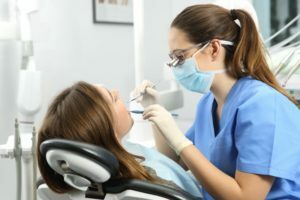 They often perform a pre-exam before the dentist, so their input is very significant when it comes to putting together a patient’s long-term treatment plan. In addition to being a people person, a hygienist also needs to have a strong drive to help people as well as the ability to calm those who might be really nervous about receiving dental care. This is why some of the friendliest people you’ll ever meet will be hygienists. They literally just want to help people smile! At your next checkup and cleaning, try to take special note of everything your hygienist is doing for you. Your dentist couldn’t do what they do without them! Thanks to their efforts, people in Oklahoma City as well as around the world are able to enjoy clean, healthy, and confident smiles year after year. The next time you need advice about you or your family’s oral hygiene, be sure to ask one, and you can trust they’ll tell you everything you need to know. Dr. Michael Kirk is a family, restorative, and implant dentist who has been practicing in Oklahoma City for more than 25 years. He along with our team of dedicated hygienists and assistants strive to provide top-of-the-line dental care and service to local families every single day, and nothing makes him happier than seeing someone smile because of his efforts. To learn more about everything you’ve just read, he can be reached for questions through our website. by: Dr. Michael Kirk at April 10, 2019 .